In the Fall of 2008, St. Peter’s Faith Formation Program launched its brand new addition to our Faith Formation offerings: Autism and the Sacraments. This new approach to faith formation is peaceful, welcoming & innovative – adapting to each child’s individual learning style – in a compassionate, loving & inclusive environment. The program is tailored to children on the autism spectrum, those with developmental delay(s) and children who are non-verbal. The response to this one-of-a-kind program in the Diocese of Providence has been wonderful – families from every corner of RI & beyond have enrolled! Each Year we celebrate a number of beautiful Masses with our Autism & the Sacraments families; an opening Mass in the Fall, a Mass of Peace in the winter, and a closing Mass each Spring. If you are interested in having your child enroll, please call Margaret Andreozzi, elementary faith formation coordinator, 401/461-5691, or email by using the link below, to be placed on a waiting list for our program. OR if you are moved to contribute financially to the many needs in facilitating our program, please contact our parish office: 401.467.4895. Thank you! It was a happy reunion at our recent Christmas Mass as many former students and their families returned to celebrate the season with us. In gratitude, we give pause at the humble arrival of Jesus in our world and lives. Closing Mass -Spring 2018 - for our Autism & the Sacraments Program. Once again, we give thanks to God for all He has accomplished in our time spent together. We've witnessed many "God Sightings" - many graces, throughout the year. A special thanks to all the dedicated parents and volunteers, especially Margaret Andreozzi and Fr. Gagne. We're always happy to share photos that capture the joy and gratitude of the families in our Autism program. We thank God for the opportunity to serve and support them on their journey. Come Holy Spirit! What a grace for our community to be a part of these children's lives over the past several years while helping them prepare for the Sacrament of Confirmation. There has been spiritual growth all around! A special thanks to Bishop Tobin for his presence with us on this blessed day as well as his encouragement and support in our efforts through the years to bring spiritual formation and the love of Christ to those within the Autism spectrum in our Diocese. We've reached the conclusion of another year in our Autism & the Sacraments program here at St. Peter Parish. Families and volunteers were full of smiles and gratitude as we came together to celebrate the truly awesome sacrament of Holy Communion. It is always humbling to see the reverence and joy of the children as they experience Jesus in a whole new way. A big thank you to all the dedicated parents, volunteers, as well as Margaret Andreozzi and Father Gagne for all the prayers and teamwork that go into making the year a success. The Christmas Mass for our Autism and the Sacraments Program took place Saturday as we ventured out in our first snow of the season. As always, the joy and love of God was present as we came to together in anticipation of the coming of His son. We give thanks for all God is doing for and through us here, and as always, we're humbled by how much we receive by the children we serve. Welcome to our Autism Program as we begin our 9th year, and fittingly on the Feast Day of Therese of Lisieux! Currently we have 25 students enrolled in the program, 9 of which will be receiving Holy Eucharist (April 22nd of 2017) and 6 are to be Confirmed (April 29th, 2017). As always, all are welcome to attend! We are grateful for what God has done for us! To date, 30 of students within the Autistic spectrum have received their First Communion and 16 have been Confirmed by Bishop Tobin. We look forward to sharing the love of Christ with these eager children, and to the rewards and challenges that this year will bring. And as always, are very appreciative of all our teachers, volunteers, committed families, as well as the dedication of Mrs. Andreozzi, and Fr. Gagne. 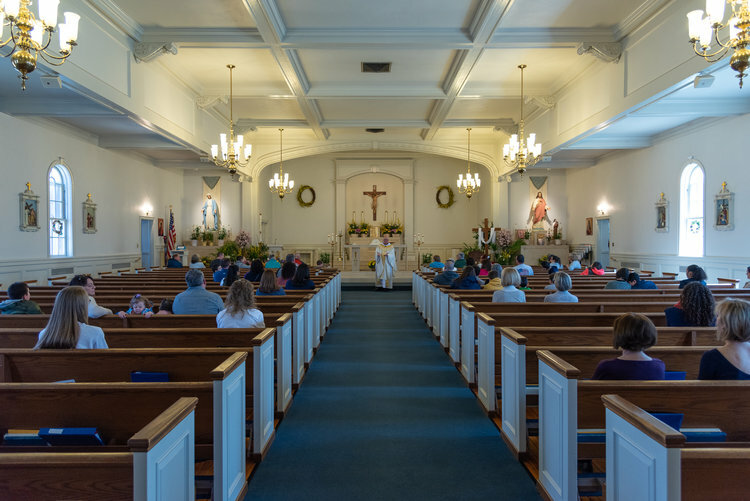 Read the latest article about the program published by The Rhode Island Catholic: "St. Peter formation program a vital ministry for autistic students"
We had one First Communion this year, and many kids lined up to continue classes in 2016/2017. Thank you to ALL our teachers, aids, volunteers, Fr. Gagne' and Margaret Andreozzi – we all continue to stand amazed at what God is doing in our midst! The Christmas Mass for the students and families participating in our Autism program went beautifully. As always, Thank you to those in our parish family, for your support and prayers, and for the hard work of all those involved. Special thanks to Fr. Gagne, and Margaret Andreozzi for making this special program possible in order to provide religious education and the sacraments to many who fall within the Autism spectrum throughout our diocese. Welcome to another year of St. Peter's Autism & the Sacraments. We're off to a busy start with several new families, as well as returning students and teachers who are eager to discover what God has in store in the coming year! Please pray for grace, and the openness of all those who are involved, so God's will can be accomplished in bringing about the growth and spiritual formation of all our students in the program. Come Holy Spirit! Congratulations to our candidates who received the Sacrament of Confirmation today! The journey continues for these nine students in a new and grace-filled way! A very special thank you to the committed families of our students, our generous staff and teachers, to Margaret Andreozzi and Fr. Roger Gagné–in their tireless dedication, and especially to Bishop Tobin for being present and supportive throughout the year. Please pray for God's grace and guidance as we continue to provide religious education and sacraments to those with special needs in our community. Another year of our Autism & the Sacraments Program draws to a close. Closing Mass was a well-attended and joyful celebration! As community, we look forward to supporting several of our students next month as they stand before Bishop Tobin for the Sacrament of Confirmation. Please pray for the candidates on this very special day, and for the coming of the Holy Spirit! Pictures taken during our Autism Christmas Mass. It was beautiful, well-attended and lively! Thank you Fr. Gagne, Margaret Adreozzi, parents and volunteers for making this day so meaningful for our kids and parish family. On October 4th, (the Feast Day of St. Francis) we had our opening Mass for our 7th year of the Autism and the Sacraments Program! We welcome everyone back as well as several new families who will be joining us this year! Please pray for the Holy Spirit to guide our teachers and parents as they educate and prepare them for the Sacraments. Pictures taken from this year's Christmas Mass – It is always amazing to witness such faith and reverence at the reception of Holy Communion. Emmanuel – God is truly with us! Continue to pray for God's grace and guidance for all those involved in this wonderful program! What better way to celebrate Pentecost this year than by welcoming Bishop Tobin to St. Peter’s on Pentecost Eve to confirm 8 students in our Autism & the Sacraments Program! While we have had several First Communion Masses for the program, this was our first Confirmation ceremony. The students were very excited and well prepared. We give glory to God for all that He done for us. Many thanks for the hard work, dedication and support of all those involved! This was a truly joyful celebration to conclude another very rewarding year! We had a wonderful First Communion and closing Mass in May for the children in our Autism program! Thanks for your prayers; it has been a remarkable year for everyone involved. We are truly thankful for the opportunity to have shared what God is doing in our Autism Program here at St. Peter’s with Bishop Tobin. On November 17th, 2012, he was able to visit each classroom and meet the teachers, students and their families, offering his encouragement, prayers and support. He experienced first-hand the beautiful graces that we, as a parish, have been able to enjoy these last few years as we’ve witnessed God working so powerfully among all those involved in this program. Special thanks to Margaret Andreozzi and Fr. Roger Gagné for their profound dedication to this ministry, as well as the many volunteers and parents who have worked so hard together making it all possible. Please continue to pray for us as we endeavor, with God’s grace, to meet the spiritual needs of those on the Autism Spectrum within our communities. We are looking forward to another special year of growing and learning with our Autistic Children, their families and our many volunteers. We had a very nice opening Mass as we welcomed some new students and teachers to our program. Please pray for God’s continued blessing and grace for this upcoming year! We have reached the end of another great year in our Autism Program. In our closing Mass, we were able to celebrate one First Communion as well as the continued growth of many others who are preparing for the Sacrament of Confirmation next year, with Bishop Tobin. This past year has been a great joy and growing experience for everyone involved as we continue to learn with, and from each other. We continue to thank God for His grace and generous provisions for us, as we endeavor to bring the Sacraments to those on the Autism spectrum in our community. It is evident by the responses and the smiles of those taking part, that God has revealed Himself in a very special way and continues to bear witness of His great love for all people. Thank you parents, children, teachers, Margaret Andreozzi, and Fr. Gagné for another wonderful year! Read about our Autism Program here at St. Peter’s in the recently published article: “Program Teaches Faith to People with Autism” in Our Sunday Visitor, a national newsweekly magazine. Our program received national recognition when Associated Press reporter Ray Henry published his wonderful article, “Autistic Offered Religious Education” following his visit with our class! Complete with photos and interviews with the class, the article has been shared all over the United States (even in Hawaii! ).